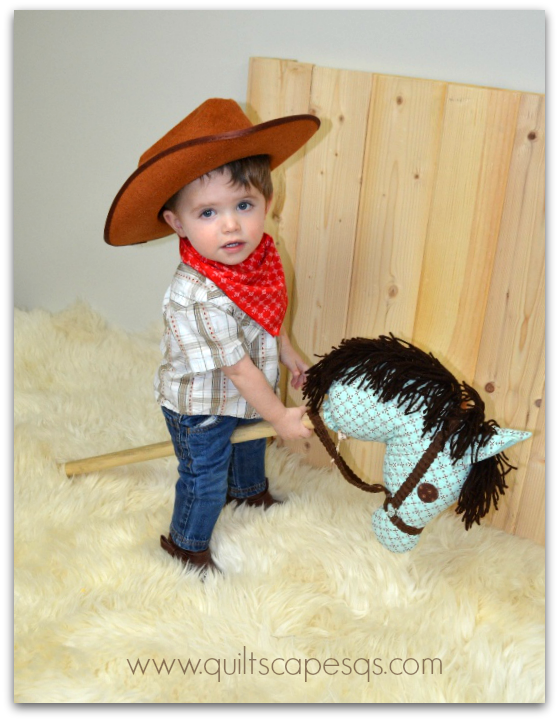 Meet the cutest Lil' Cowgirl! This little sweetie just turned four! 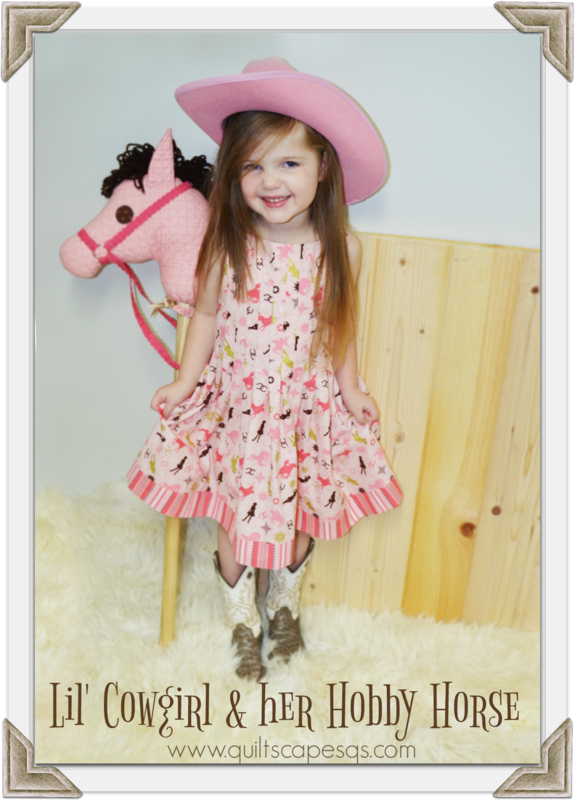 For her birthday, her grandma (my friend Debbie), whipped up this adorable dress, and even found a pink cowgirl hat to match! Then grandma made an identical mini dress for the dolly. So stinkin' cute! 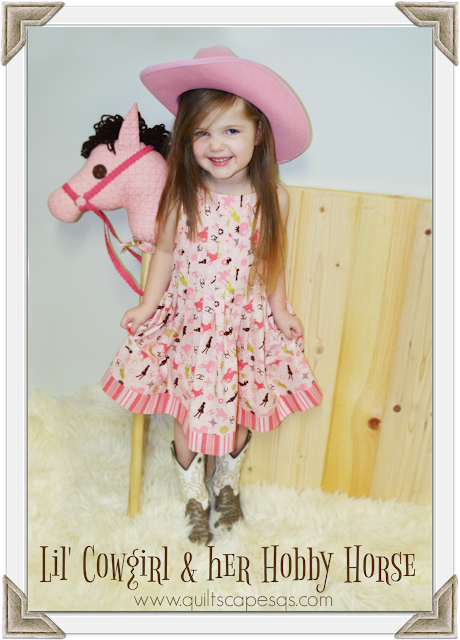 Lil' Cowgirl loves horses (oh, and unicorns too), and this cute fabric with sparkly gold accents is just perfect for the little gal. 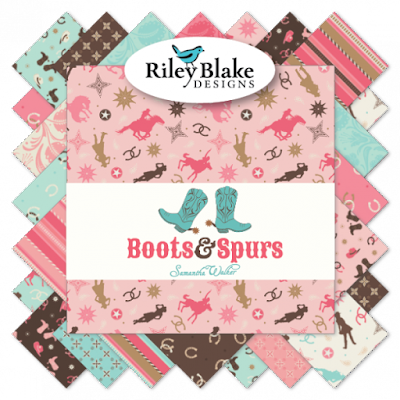 Boots & Spurs is designed by Samantha Walker for Riley Blake Designs, now available locally at Pine Needles, find it online, or ask for it at your local quilt shoppe. 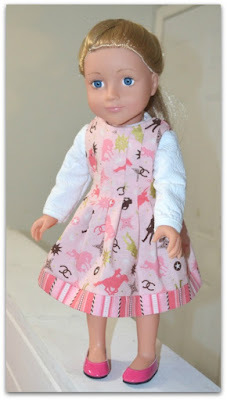 You can also find the "Easy-Peasy Pleats" dress and matching doll dress pattern by Olive Ann Designs HERE. I love collaborating with Debbie, who was our county's 4-H Extension Agent for over 30 years, and is a great friend. She helped teach my own daughters to sew and gave them leadership opportunities through 4-H over the years. Now she's retired, and happens to have grandkids, and it is so fun to put our heads together to come up with fun project ideas when the invitation comes to play with some new fabric from Riley Blake Designs! 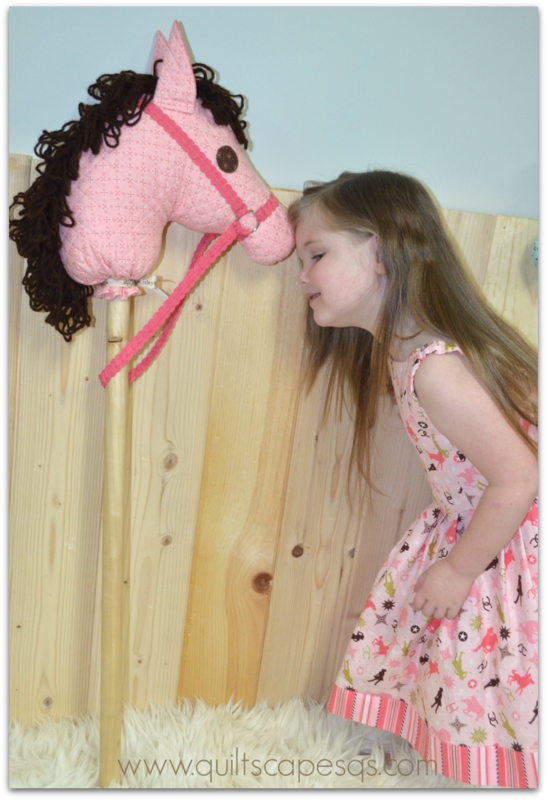 To complete the outfit, a sweet little Hobby Horse to match the dress! 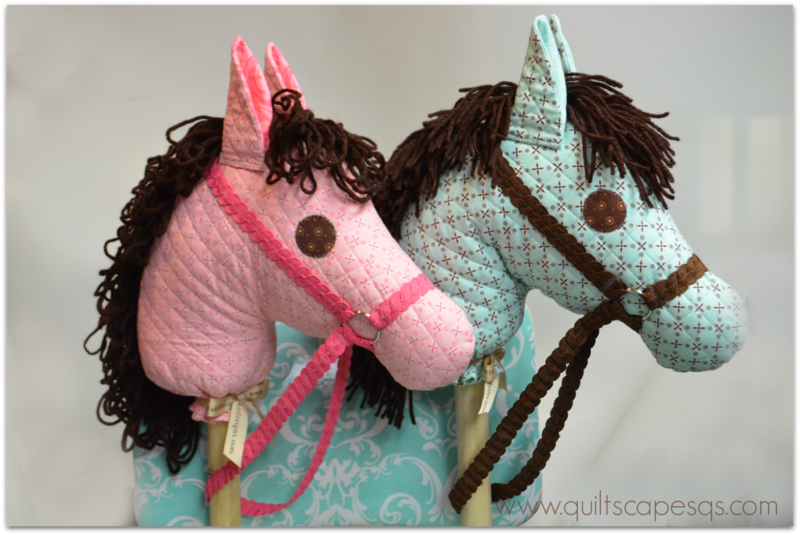 First, I quilted up some of the Boots & Spurs Bandana fabric for the hobby horses. You can find the pattern link below, but I wanted to show a couple of our tips. 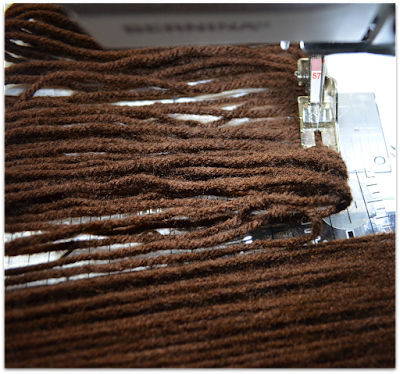 For the mane, Debbie wound some yarn around a 4 1/2-inch wide ruler. As she slipped it off the ruler, she stitched through the yarn at one edge to hold it together. 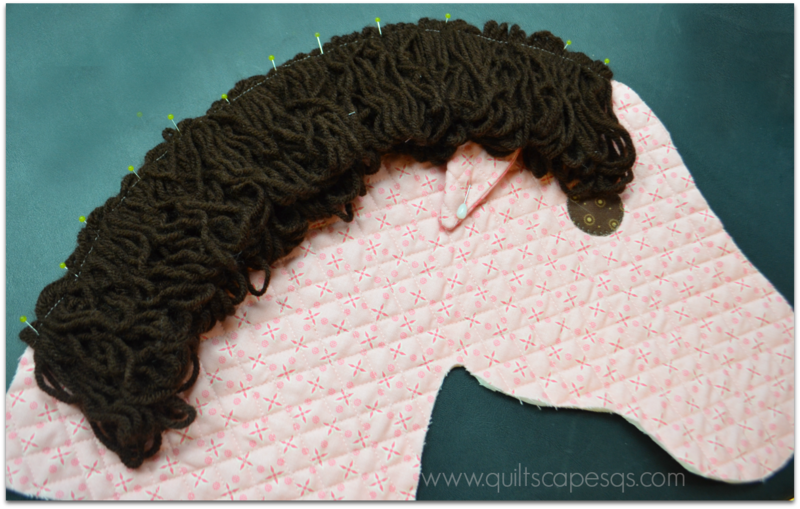 Then it was easy to lay it out, ready to be stitched in the seam of the horse's head. The "bridle" is 3/4 inch RBD ric-rac, with two strands twisted together and stitched down the center and sides to hold it together. I think it looks like rope! 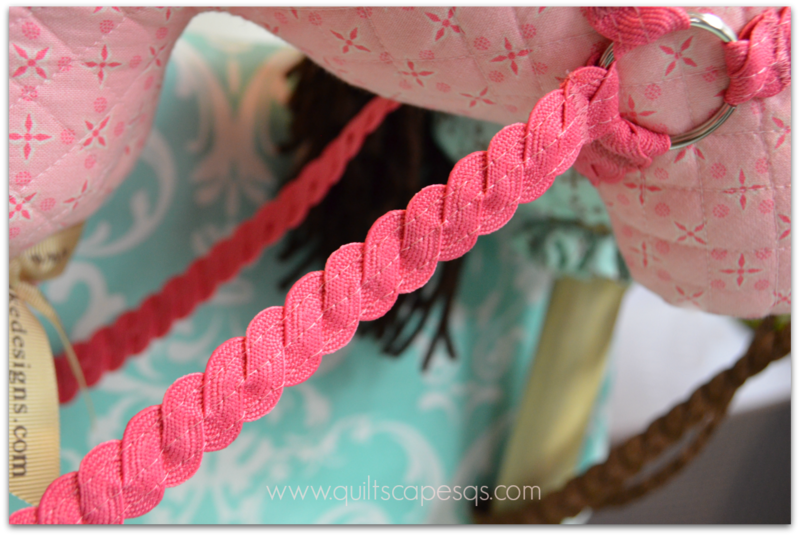 A couple of keychain rings made it easy to produce the bridle. 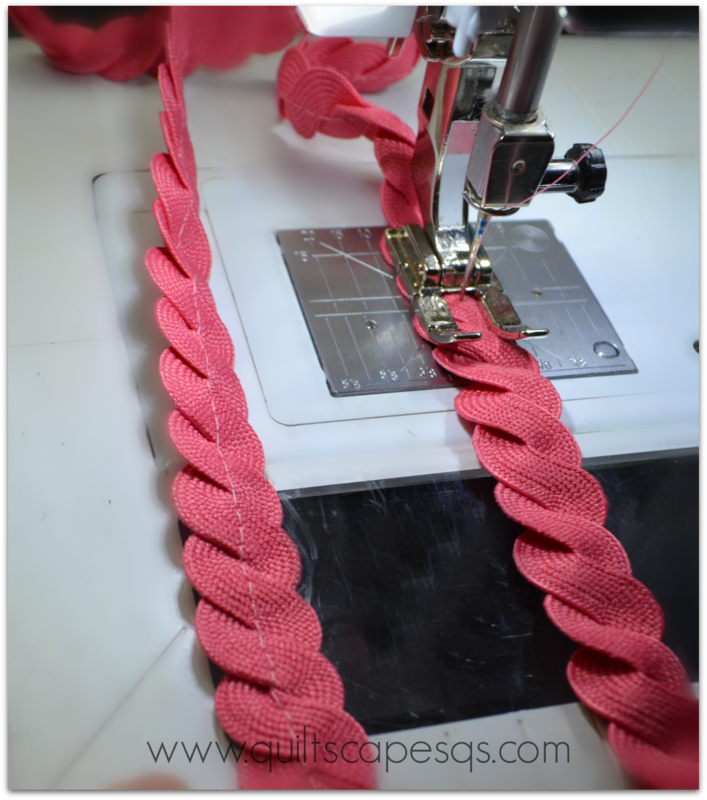 A loop of reins to finish, and they're rearin' to go! You can find the pattern for the Hobby Horse HERE. Quick and easy, nothing too complicated. So fun, I had to make more. Even baby brother got in on the fun! And after galloping all around the house and up and down the stairs (going down was a bit tricky! ), Lil' Cowgirl was plumb tuckered out! Happy Birthday, Lil' Cowgirl! What's next?? 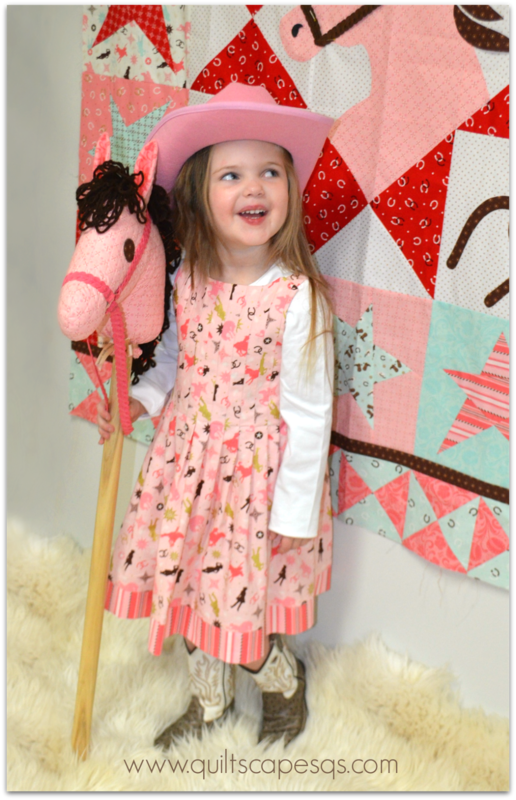 Well, winter is upon us, and I think our Lil' Cowgirl might just like like a matching quilt... coming soon - stay tuned! p.s. By the way, my friend Carol has made some super cute things using some of the "boy" prints of this range of fabrics. Check them out HERE! 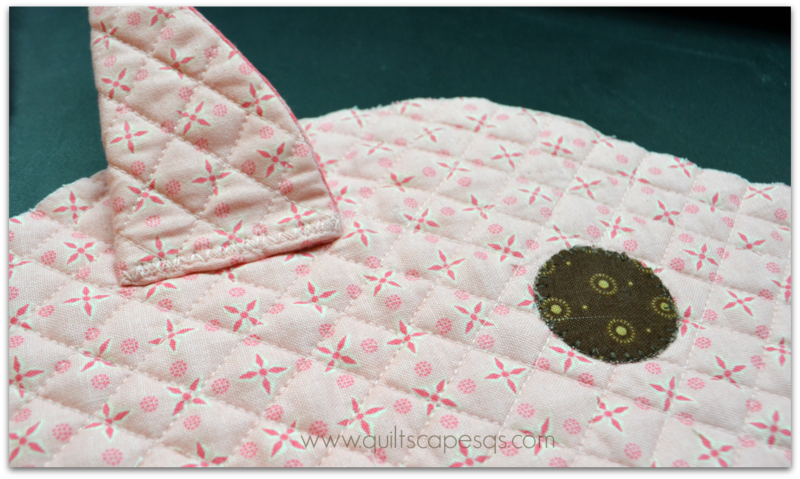 Also, my friend Julia made the sweetest baby quilt and shared her tutorial HERE! Sew adorable! This whole set is adorable for that little cutie! I love the fabric and you, of course, totally made it look amazing in all those projects. 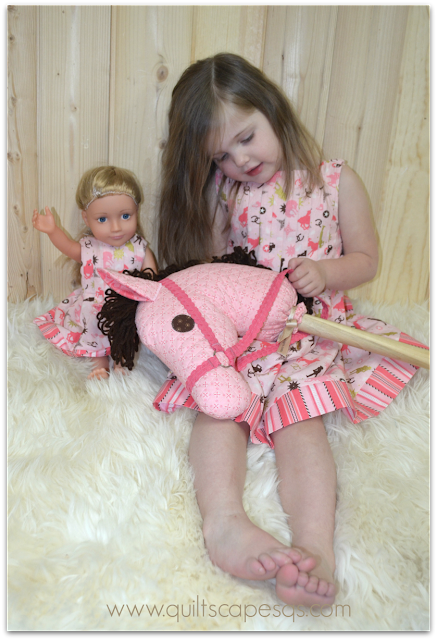 Oh what a cute dress, and the hobby horses are fabulous. OMGoodness.....that is so cute. Love the photographs too. Oh, Deonn, I love everything about this post. 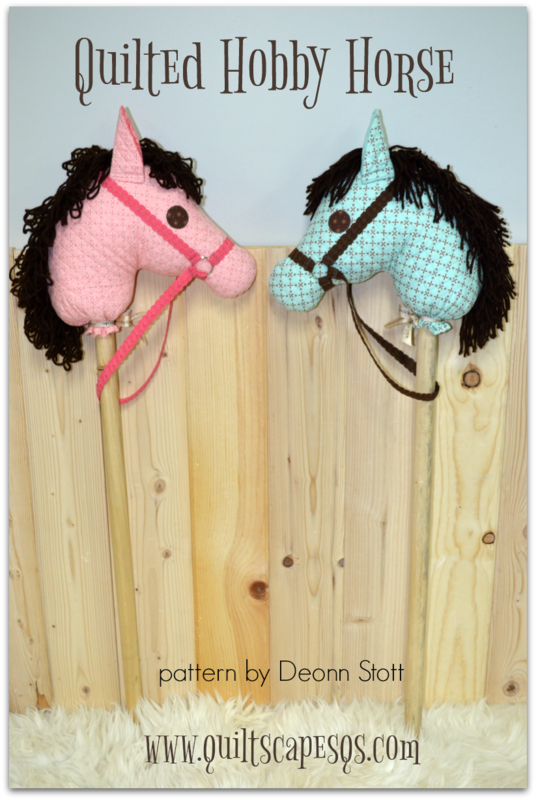 You had me at boots and put me over the moon with Hobby Horses. Too cute! Oh, and your models can't help but put a smile on this girls face. Oh, my goodness! She’s a little doll, and baby brother is just as cute! Love the fabric line, the dresses, and especially the hobby horses! They are so cleverly constructed. Wish I had someone to make one for.